1927. Loudspeaker. Exhibit at Amberley Working Museum. 1924 Cyril French set up a small business to manufacture loudspeakers in the picturesque Thameside village of Hampton Wick. French had been approached by Eric Mackintosh for help improve his invention, one of the earliest cone loudspeakers. French and two of his brothers, Leonard and Edgar, had taken over the Thames Valley Plating Works at 29 High Street, Hampton Wick, and created the Electrical Manufacturing and Plating Co, listed as ‘electrical instrument manufacturers’. 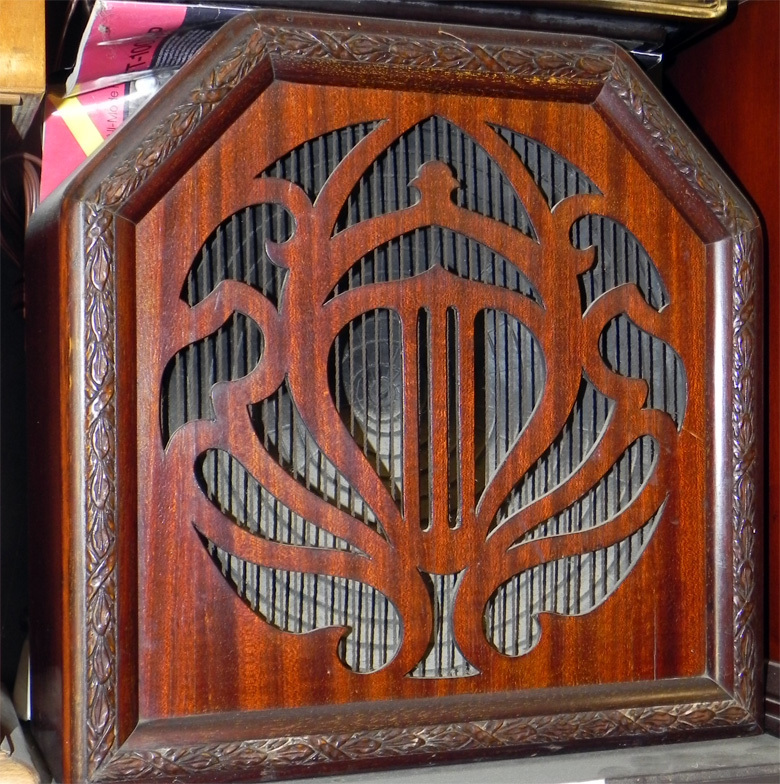 French and Mackintosh finally perfected the loudspeaker design and, now joined by Cyril’s other brother Ralph French, began manufacturing upstairs while Leonard and Edgar French continued below with the plating business. 1925-6 The original Mackintosh design employed a free-vibrating edge and was patented in March, 1925. The modified French/Mackintosh design used a clamped edge and was patented in January, 1926. The conical paper diaphragm was strengthened with strips of bamboo imported from China. The driving mechanism at this time was a moving-iron balanced-armature type. These were the early days of wireless, viewed by the majority of the population as the modern wonder. The British Broadcasting Corporation (BBC) had been formed in August 1922, registered on 15 December of that year, but actually began radio broadcasting in November. After the success of the London station, two further stations were opened at Birmingham and Manchester. Receivers were of two types; the valve set, which was regarded by the populace as ‘awesome’, and the more simple crystal receiver - the initiation of many to the marvels of wireless. Easy to tune, low-cost and a good variety of manufacturers made this the more popular receiver, many thousands of which were produced by home constructors. Earphones, comprising two coils wound on a horseshoe magnet vibrating a metal plate, were essential in order to convert the weak signals into sound. It was into this world that the new Celestion speakers emerged, becoming a necessary component of the new valve receivers that appeared as a result of the BBC stepping up transmitter power, and also providing alternative programmes. Powerful wireless transmitting stations also appeared in Europe, and it became possible to pick up their programmes via the new, more selective, wireless receivers. The era of earphones passed, to be replaced by the free standing horn reminiscent of the ornate specimens beloved by the gramophone enthusiasts. These cumbersome sound appliances gradually gave way to the separate loudspeaker cabinet, always regarded as a piece of furniture and often highly decorative as it took pride of place in the lounge, or ‘front room’. 1925 The Celestion loud speaker was launched early in 1925 by The Electrical Manufacturing and Plating Co, at a retail price of £6/10- (£6.50), with a choice of oak, walnut or mahogany cabinet. It was sold as ‘The Loud Speaker of Distinction’ and was favourably reviewed. An associated company, Constable-Celestion, was formed in Paris, and export by air took place from Croydon Airport. 1926 The Celestion Radio Co was formed; it made Celestion loudspeakers and Celestion Woodroffe gramophone pickups. 1928 Celestion Limited was incorporated as a public company to acquire Celestion Radio Co; Cyril French took a contract for 10 years as managing director. 1929 With a burgeoning trade, a move to large-scale manufacturing premises was inevitable, and Celestion Ltd moved to 145 London Road, Kingston-upon-Thames. By 1930 Celestion was moving in both the mechanical and electrical spheres of the home entertainment industry. The units were so popular that Celestion issued a separate booklet for Electric Gramophones, Reproducers and Band Repeater Equipment for ships. With the mass production of mains receiving sets, which overcame the disadvantages of batteries and accumulators, the demand for loudspeakers steadily grew and their styles became less ornate, the fretted front being replaced by a cloth or metal grille. 1935 The worldwide recession hit Celestion badly. 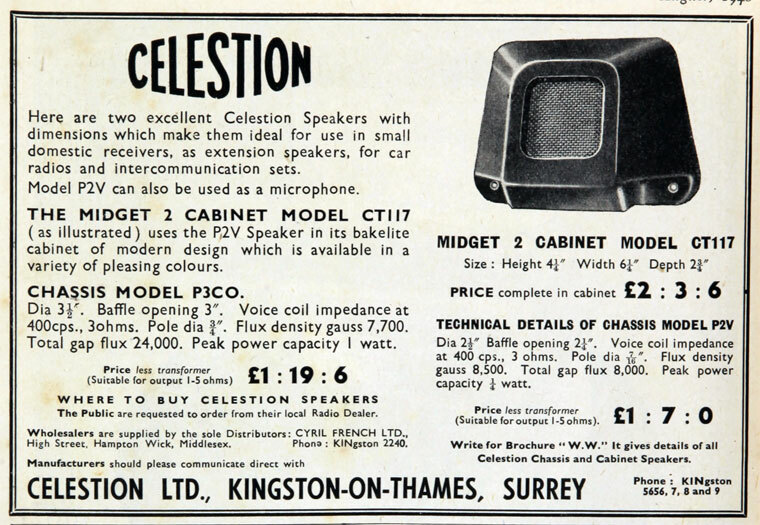 The first ‘boom’ era came to an abrupt end and an advertisement in The Broadcaster and Wireless Retailer in April announced that Cyril French had resigned from the board of Celestion Ltd. French returned to the old site at Hampton Wick to operate as sole wholesale and retail distributor of Celestion products in Great Britain. At the same time, British Rola, an offshoot of the Rola Company of Cleveland, Ohio, USA, had been making a similar product at Minerva Road, Park Royal, London NW10 since 1934. The two companies were in competition for the home and export markets, and their products were influenced by changes in the wireless receiver market. As the receiver became more sophisticated and smaller, so the loudspeaker began to be housed within the receiver cabinet itself, thus dispensing with the separate speaker unit. To keep in line with this new development both Celestion and British Rola designed and produced a series of smaller speaker units, often to the receiver manufacturer’s specification. Prior to World War Two, radio accessories were manufactured by Celestion and these included such items as "MIP" (moulded in plate) radio valve holders. WWII. During the war, both Celestion and British Rola were restricted to the manufacture of one type of loudspeaker, the utility "W" type. 1947 British Rola acquired Celestion Ltd in April, together with a subsidiary firm, Pressmach, which originated at Woolacombe, Devon, and another small pressing firm, Belark, also came under British Rola control. The Investors Chronicle for 1946 reported that British Rola would be responsible for the production of considerably more than half of the loudspeaker trade in the United Kingdom, and the two companies together covered practically the entire export loudspeaker business. 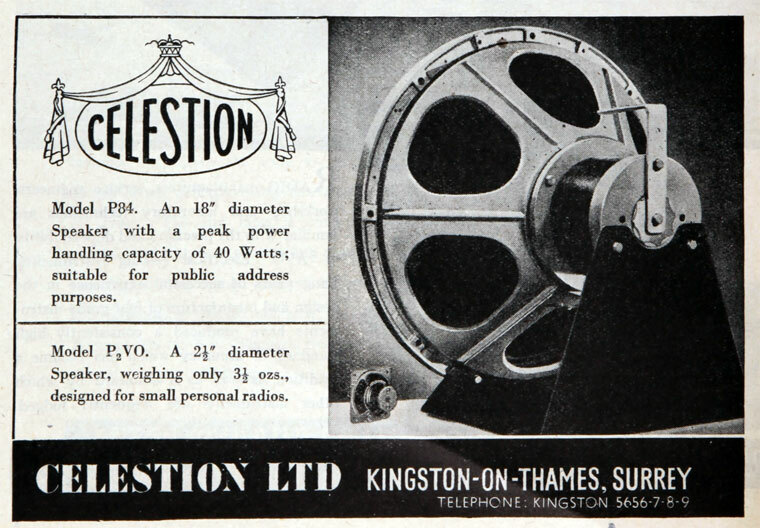 1948 During July, Celestion ceased production at Kingston-upon-Thames, and production machinery and personnel moved to Thames Ditton as a consolidation of the two companies. The company title became Rola Celestion Ltd, and Celestion was adopted and registered as the trade mark for the company’s product. As the post-war market evolved and product demand was established, it became evident that the new wonder - television - would account for a large number of loudspeakers, although the radio speaker market was still strong. As the television population grew, so did the need for speakers and the Thames Ditton production lines were fully engaged meeting the manufacturers’ deadlines. 1949 Rola Celestion was acquired by Truvox, a company based in Wembley and well known for its Public Address loudspeakers and systems. These covered the whole spectrum of this market and included such units as horns and loudspeakers for cinemas and many acoustic devices for the Forces which Truvox had developed and produced during World War Two. This era gave birth to the stereophonic long playing record and, as the taste for high fidelity increased, so did the demand for even better sound and stereo. Alongside production of the domestic and power speakers were the units of the Public Address range, many of which were designed to meet Government specifications for use by the Armed Forces, Local Authorities, Police and Fire Brigade. Built to stringent specifications these speakers often performed in extremely difficult and arduous conditions such as coal mines, chemical works, aircraft and lifeboats. The burgeoning market for live, amplified music gave rise to the guitar loudspeaker. 1960s Celestion’s design team, fired with success, continued the endless pursuit of ultimate sound quality. 1968 As the demand for their Ditton loudspeakers mounted, production became a problem at the Thames Ditton factory and it was decided that, as expansion at the present site was restricted by the river and road perimeters, a new location was the only obvious solution. A site was acquired on Foxhall Road, Ipswich. New buildings were constructed, existing ones modified and the nucleus of a work force recruited using ex-Thames Ditton supervisory staff to train the new employees. Production began in Ipswich in late December. As the weeks passed the interior of the Ipswich works began to house more and more sophisticated production machinery and more staff were engaged to operate the lines, which were now able to relieve the problems at Thames Ditton in the supply of domestic speakers to the manufacturers. 1969 Reverse take-over of Truvox Engineering, "the Rola firm", which was injected into the Weingarten Brothers corsetry group; this transaction valued the owner (D. D. Prenn)'s shares at £1.26 million. The company created was by this was named Celestion Industries plc. The production of domestic speakers reached a peak after about three years at Ipswich, and then a shift in the market evidenced itself and a noticeable decline in this product became apparent in the factory. Its place, however, was taken by units for the ever increasing demand for high fidelity stereo cabinet systems, and at this time further expansion took place with the acquisition of a modern assembly plant on the Hadleigh Road Trading Estate on the other side of Ipswich. Ditton Works now concentrated on the manufacture in all aspects of hi-fi component units, Power Range loudspeakers and units in the Public Address sector. 1974 With the surge of interest in hi-fi from the general public, staffing levels reached a peak in January, with a total of 907 employees at the two sites in Ipswich and at Thames Ditton, some of these working night shifts. Distribution was now wholly carried out from Ipswich by a new fleet of company vehicles, this being necessary for two reasons. 1975 The Thames Ditton factory was gradually run down, eventually closing altogether in 1975, and a new marketing policy by Celestion opened up a great many more smaller distribution points instead of the previous few selected wholesalers. 1979 The increasingly international nature of the company’s business led to the adoption of the name Celestion International as a corporate identity for the parent company and all major overseas subsidiaries. This page was last edited on 9 August 2018, at 20:30.